This very handsome rental apartment tower anchors the north end of York Avenue and commands fabulous views of the East River and Long Island Sound to the east. The 36-story tower has a very handsome one-story, rusticated limestone base that provides large protruding supports for the building's many columns of bay windows, a very nice design touch. 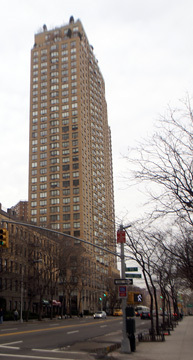 The building, which was erected in 1995 by Glenwood Management, one of the city's leading developers of luxury apartment towers, is distinguished by large windows, many of which are bay windows or corner windows. This is the most attractive of the several tall towers that line the west side of the York Avenue above 86th Street, several of which were also built by Glenwood. The building has a health club and pool, a landscaped rooftop sundeck, a doorman, a garage, a children's room, video security, valet service, and a free shuttle to the subway on 86th Street at Lexington Avenue. It has a two-story-high lobby and a 7,000-square-foot fitness center with a 50-foot swimming pool. There is bicycle storage and an air-conditioned laundry room. There are eight apartments a floor and they have washer-dryers and marble baths. There are 272 units in the building, which was designed by Costas Kondylis. 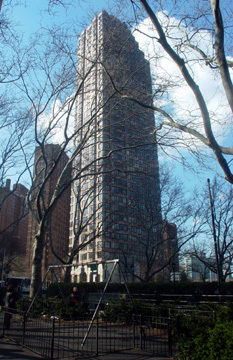 The building also has an address of 439 East 92nd Street.